Storytelling 101: Before you can get anywhere, you need at least one compelling character. Audience relatability helps, but a good writer can keep an audience invested in even a reprehensible character. In film, if you’ve decided not to make your main protagonist in any way a likable human, then the writer, director, and actor all need to work overtime to make the viewer commit a hundred minutes to someone they can’t stand. This becomes even more difficult if your unlikable character isn’t going to change at all over the course of those one hundred minutes. It can be done, but boy, it ain’t easy. Last year saw a few attempts at this, and even some successful ones, like Nightcrawler and Filth. It also saw Dom Hemingway. 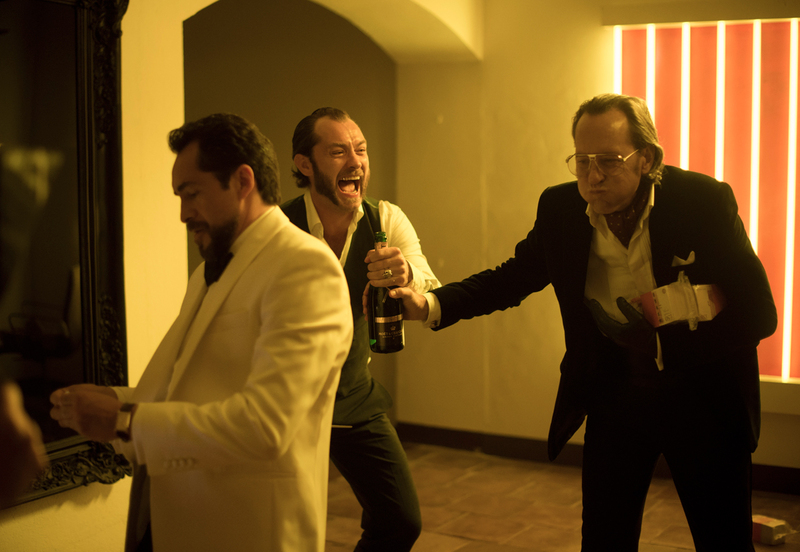 The Plot: The titular character (Jude Law) emerges from a twelve-year stint in prison with one thing on his mind: compensation from the mobster (Demian Bichir) whose secrets he guarded during his incarceration. Together with his eccentric, one-handed, posh gangster best friend/sidekick Dickie (Richard E. Grant), Dom sets out to release his wrath on the criminal underworld, whilst (of course) simultaneously trying to reconnect with his estranged daughter Evelyn (Emilia Clarke). To me, anyway, that sounds like a pretty decent, if derivative, plot for a movie. It also kind of reminds me of a Dwayne “The Rock” Johnson movie I watched part of on TV in a motel in Kansas one time, but… that’s, I guess, not really relevant… Anyway, my plot synopsis for Dom Hemingway was two things: 1) Overly generous; and 2) Totally deceptive. Sorry. 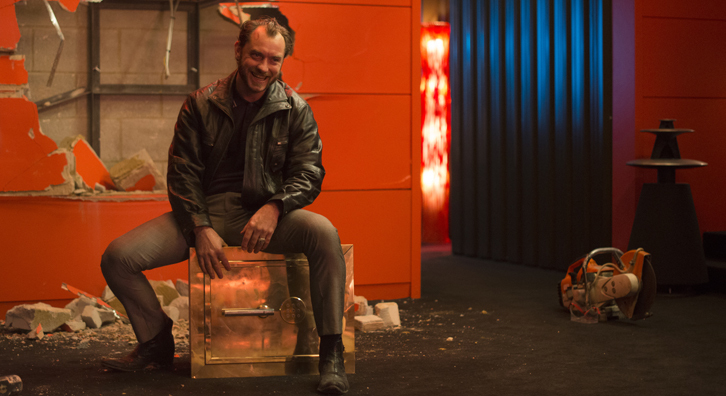 Dom Hemingway, in fact, doesn’t have much of a plot. It meanders from encounter to encounter, setting up problem after problem and then either solving them immediately or forgetting about them altogether. For example, when Dom confronts Fontaine, the dangerous mobster who owes him money, Fontaine gives him one and a half million pounds, thanks him, and they have a party. It somehow takes twenty minutes and nothing happens in terms of character development. When Dom drunkenly insults Fontaine and it looks as though he’s just dug his own grave, he apologizes a couple scenes later and all is forgiven. “Act like you’re enjoying yourself.” Probably the hardest thing anyone had to do on the set of this movie. Actually, Dom Hemingway reminds me a lot of Batman: Arkham City: the plot makes no sense; a lot happens very quickly, but none of it matters; the main character, though familiar, actually has no substance at all whatsoever, which rather nicely complements the substance void that makes up the story; the whole thing seems to be made by people with short attention spans for people with short attention spans; parts of it are sort of fun in an empty kind of way; and the script was written by an eighth grader who has, embarrassingly, never talked to a girl before in his life and, as such, just has no idea what they’re like or how they work. Girls are aliens. The cast has, collectively, been nominated for 4 Oscars, 2 Emmys, 3 Golden Globes, 2 BAFTAs (including one win), and 8 Screen Actors Guild Awards (including one win). As a viewer, I find such wastes of talent depressing, irritating, and frustrating. Jude Law, bless him, tries his darnedest with crappy material, but just can’t make miracles happen. While I appreciate the effort, he probably would have been better off not trying at all. It wasn’t worth the effort. 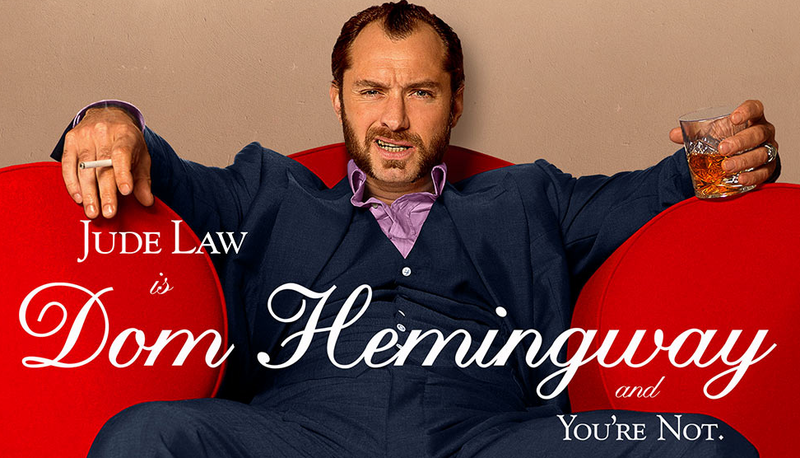 The real problem at the heart of Dom Hemingway is, as at the core of many a bad movie, a terrible screenplay. Though it clearly fancies itself clever, funny, and perhaps even original, the script falls utterly short of ingenuity and humor, as much as it tiptoes dangerously around depth and character development. The dialogue conveys no discernable degree of humanity amongst its protagonists, who rather seem motivated by greed, circumstance, and a lack of anything better to do at the time. What’s more, writer/director Richard Shepard does not know not to end a joke. Not that any of them are very funny in the first place, but when he does happen to bump into comedy by accident, he lingers painfully, knowing that to let go would mean returning to the fact that he has no plot and no idea what he’s doing at all. Anyway, I think I’ve made my point. My recommendation to you, dear reader: don’t waste your time as I did. Watch a movie that isn’t Dom Hemingway. Pretty much any movie that isn’t Dom Hemingway.